My hair color is just as important as the colors in my closet. Earlier this year I began using Moroccanoil Color Complete to keep my blonde brighter and healthier. I am always looking for ways to prolong my color to cut down on the number of trips I take to the salon, and Moroccanoil Color Complete helps me do just that. Since starting to use the Moroccanoil Color Complete regimen I have noticed my hair stays brighter for longer with considerably less breakage! Recently, I have been loving wearing my hair in a low, tight bun. 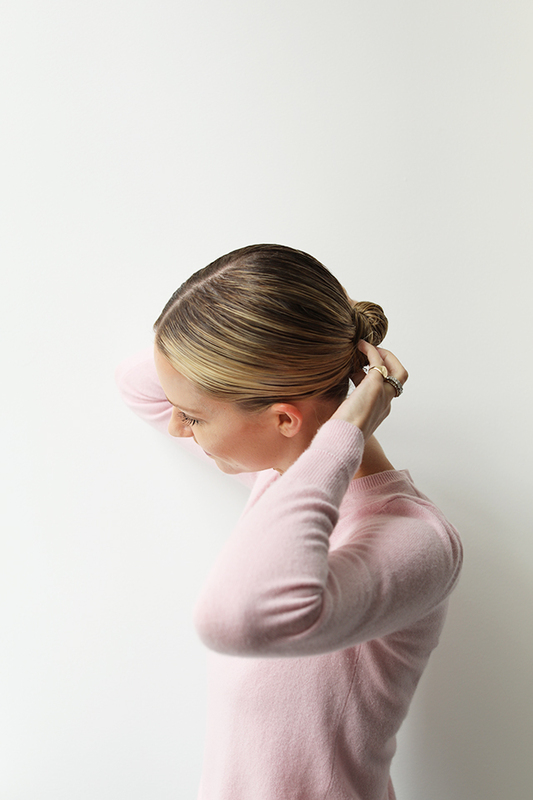 It is such an easy and quick way to do my hair each morning -and bonus – it stays looking chic all day. This style also allows me to cut out the number of days I have to apply harsh heat to my hair. This past NYFW, between the hectic schedule and horrible weather (think blistering heat, then non-stop pouring rain, and lots and lots of humidity), this was my go-to hairstyle. Scroll down to see how I achieve the look! 1. 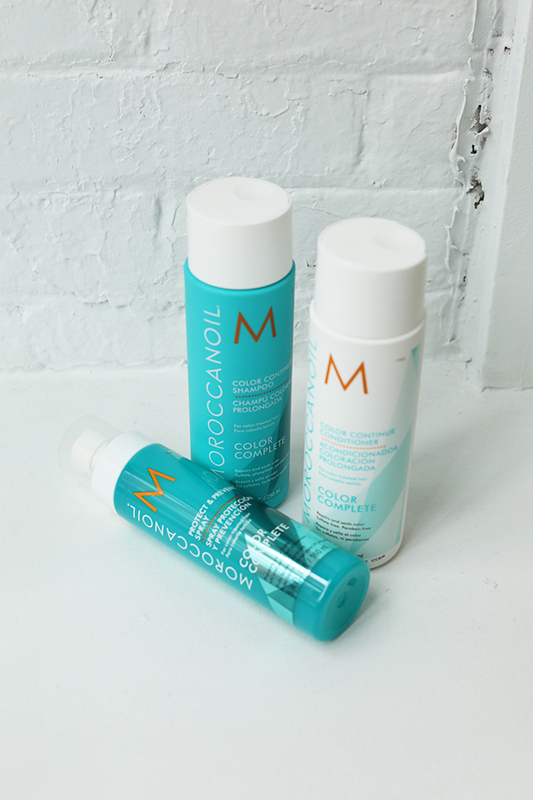 I use Moroccanoil Color Continue Shampoo and Conditioner each day to keep my hair strong, healthy and blonde! When my hair is still damp, whether I am wearing it back, straight, or curled, I use the Moroccanoil Protect & Prevent Spray. 2. I start styling by using Moroccanoil Treatment Light to create a smooth, sleek look, and to reduce any flyaways! 3. Using a boar bristle brush, I slick the hair back into a low and tight pony. 4. I use more of the Moroccanoil Treatment Light on the loose pony tail before twisting it into a bun. 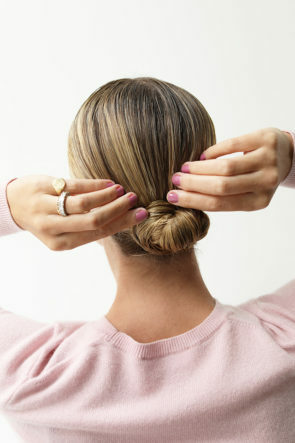 I then secure the bun with six bobby pins around the base of the twist. 5. 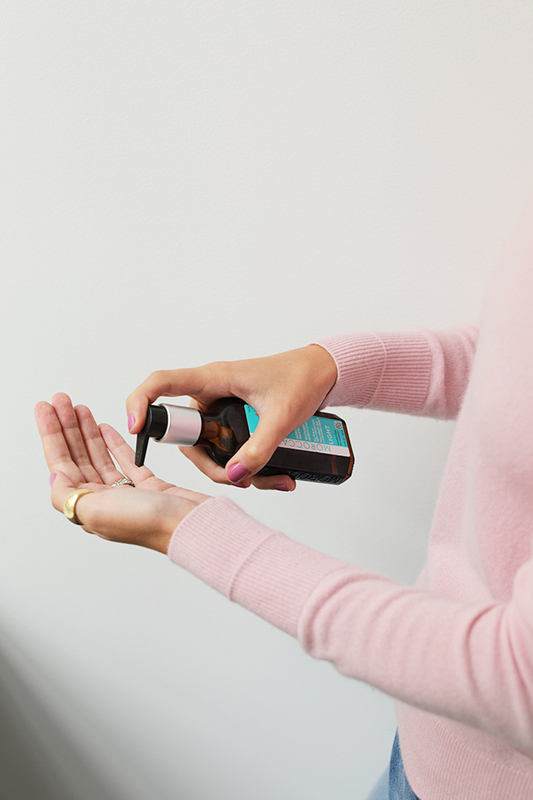 I finish off styling with Moroccanoil Luminous Hairspray Strong to ensure my hair stays in place all day. 6. If I see any fly aways or loose hairs I will use a clean mascara wand with a light amount of Moroccanoil Treatment Light to brush them back into place! For a little extra shimmer I like using Moroccanoil Glimmer Shine as the last step before heading out the door! Thank you to Moroccanoil for partnering on this post. So perfect how you combined the colours! You look gorgeous and your hair as well! You’re nun looks so chic, I can’t wait to try the look. 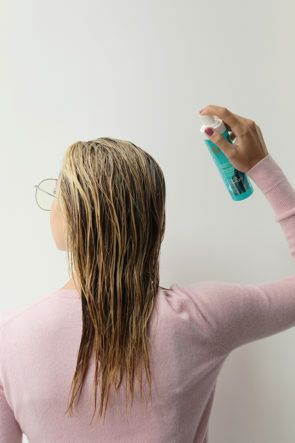 I love Moroccanoil products; shampoo and conditioner actually reduce frizz, which I previously thought was impossible! Love the tutorial, lady! Happy Wednesday! I love their hair products! They really are amazing! Love how you color coordinated with the brand’s blue color! 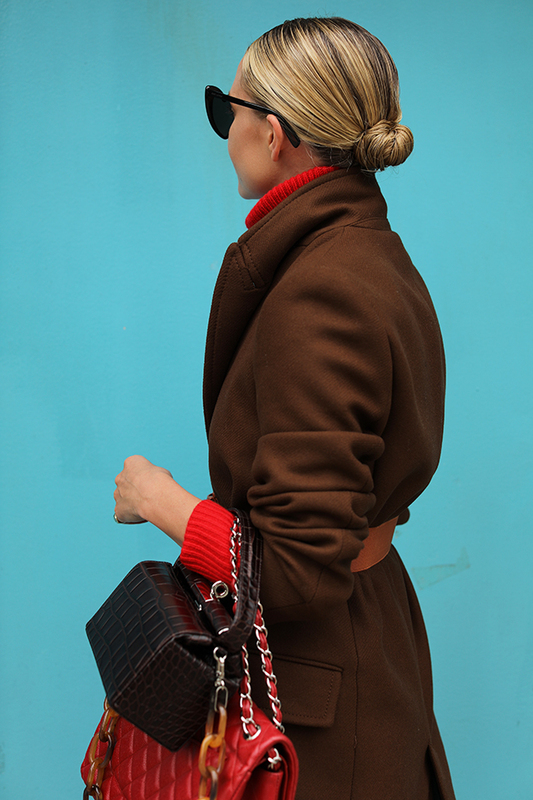 I adore the brown/blue/red color combo! I just bought red boots and will definitely use those colors. Also, your hair slicked back is my favorite. Great post! For one, this outfit is amazing, and two I love this little hair tutorial. I admire your attitude of keeping things simple and neat, and you pull of this little bun so well. Such a fan of Moroccanoil! Such a great product. I love the soft pink sweater! Where is it from? No outfit details? 🙁 Bummer….. Here are the details: Coat is from Zara, Skirt is old from Topshop, Boots are Tibi, Sweater is JCrew, and Bags are Chanel and GU_DE! You are the literal QUEEN of layering in my book – this look is fab! I like Moroccanoil products. Thanks for the recommendations and hair tips. I love that brand, it really works!! Such a chic style on you! your bun is so sleek!! Just added these Moroccan Oil products to my list to try! Could I ask what your nail polish color here is? Looking to try something new for fall!